class action Hill and Tatum play undercover drug agents who go back to school in pursuit of a dealer in this sequel to the 2012 surprise hit. Got a minute for a metaphor? Just for fun, let's think of movie comedy as a universe and consider the ways it's expanded since 2007. Something really quite remarkable has happened in front of our eyes. That was the year of the Big Bang. Once synonymous with Hollywood humor, Jim Carrey's star had gone white dwarf. He'd sunk to taking nut jobs like The Number 23. Solo shtick had given way to an ensemble-based model exemplified by Will Ferrell, who'd made Old School (2003), Anchorman: The Legend of Ron Burgundy (2004) and Talladega Nights: The Ballad of Ricky Bobby (2006). In 2007, however, Ferrell's world was in turn absorbed by the larger galactic laugh mass of Judd Apatow. That year the writer-director altered the comic space-time continuum with Knocked Up and Superbad. Suddenly the movie world was not only funnier, raunchier and less predictable, but brightened by a constellation of shining talents around whom funny business henceforth would revolve. Those included newly formed stars like Seth Rogen, Jonah Hill, Michael Cera, Emma Stone, Danny McBride, Jason Segel, Steve Carell, Jane Lynch, Kristen Wiig, Craig Robinson, Mindy Kaling and Paul Rudd. The form had evolved from a one-person show to a gang activity. Consider last year's This Is the End: Most of the aforementioned comedians made an appearance there. That's the way of comedies today. Many of those people also appear in 22 Jump Street, the year's second gonzo gutbuster from Phil Lord and Christopher Miller (The LEGO Movie), who aren't so much part of Apatow's world as a parallel universe. 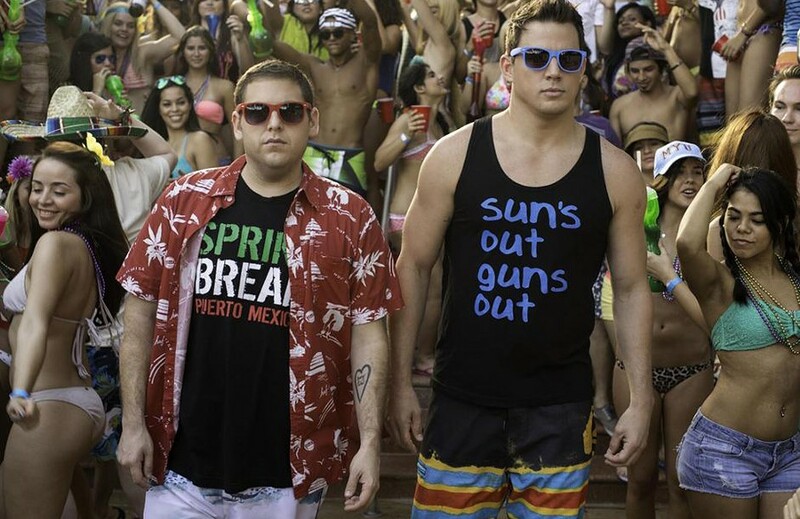 Jonah Hill and Channing Tatum reprise their roles as undercover agents Schmidt (Hill) and Jenko (Tatum) from 21 Jump Street. "Reprise" is the operative word. The joke in the first movie was that brass were rebooting an old program because they'd run out of new ideas — not unlike the producers who recycled an '80s TV series as a feature comedy. Matters here get decidedly more meta. The joke everybody's in on is that this is that most maligned of traditions — a sequel. "Do the same thing as last time," supervisor Nick Offerman winkingly orders the cops, "and everyone will be happy." So it's back to school. The characters are in college this time, but again in search of a mysterious dealer and again looking laughably old. Writers Michael Bacall, Oren Uziel and Hill do the impossible, simultaneously repeating and topping themselves with gags decrying the forms' conventions while deftly defying them. And a new star is born. Jillian Bell slays as a student who calls Schmidt on his crow's feet. "I'm 19," he insists. "Nineteen minutes late to pinochle," she deadpans. "Tell me about the war. Any war." If this were Bridesmaids, Bell would be Melissa McCarthy. Totally bonkers. Totally breakout. She steals Act Three. I could go on about what a laugh-a-minute rabbit hole of self-referential brilliance this is. Blink and you'll miss Patton Oswalt as a professor proving he can say anything because he has tenure. Or Rob Riggle with the non plus ultra of prison jokes. But I'll let you discover its deceptively dumb wonders for yourself. One more thing: Stay for the closing credits sequence. The movie may be over, but some of the best, most bitingly insightful yuks are yet to come. 22 Jump Street takes Hollywood comedy to a whole new place — a neat trick for a picture whose business plan is revisiting the past. And with the second-biggest opening ever for an R-rated comedy, everyone is happy indeed.